Acqua di Parma has “re-styled” original Colonia* (introduced in 1916) to produce the brand new Colonia Essenza. I’ve recently seen Colonia Essenza in two big department stores: Holt Renfrew in Vancouver, B.C., and Nordstrom in downtown Seattle. Holt Renfrew sells the fragrance only in the men’s department; but so far, Nordstrom displays Colonia Essenza with women’s fragrances — even though there’s an Acqua di Parma section in the men’s perfume boutique. Colonia Essenza is, in stores and online, sometimes referred to as a men’s fragrance and other times as a women’s perfume, but I think Colonia Essenza is a classic cologne-for-all…even children can wear it. Colonia Essenza includes notes of bergamot, tangerine, lemon, orange, grapefruit, petitgrain, neroli, clove, rosemary, lily of the valley, rose, jasmine, patchouli, vetiver, white musk and amber. Colonia Essenza starts off smelling like a crisp orange blossom Eau de Cologne. As orange blossom fades, warm, but still pert, citrus peel aromas appear and lead directly to Colonia Essenza’s floral heart notes. Throughout its development, Colonia Essenza never completely loses its floral character, but it goes from a sunny and warm green-citrus-floral composition into shady-and-cool scent territory. As the cologne enters its final phase, I get the feeling clouds, and a cold front, have moved through Colonia Essenza’s “garden,” chilling the flowers and fruit...and blunting their aromas. I love Colonia Essenza’s diminuendo: the muted base notes of “shadowy” rose and lily of the valley, chalky wood, desiccated patchouli, dusty musk, and stark, cool amber. Colonia Essenza is, overall, a conservative fragrance; but it’s more dashing, less prim, than its progenitor, Colonia. Though Colonia Essenza’s base notes are soft and a bit talc-y, they don’t possess original Colonia’s “soapy”/“fresh laundry” vibe. Colonia Essenza has good lasting power and "proper" sillage — it doesn't dominate a room. 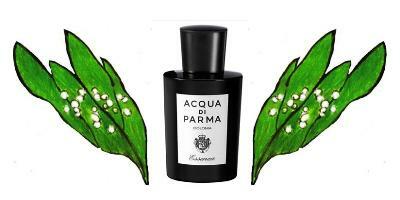 Acqua di Parma Colonia Essenza is $90 for 50 ml and $125 for 100 ml Eau de Cologne. For buying information see the listing for Acqua di Parma under Perfume Houses. Note: top image of lily of the valley [altered] via Wikimedia Commons. Oh, Kevin! I’ll have to seek this out in my Nordstrom for a skin test. Something about the Acqua di Parma aesthetic really appeals to me; I love their packaging, though this all-black version is probably less appealing than other versions. Essenza does sound nice, though not necessarily like a “must-have.” I will admit that Colonia Intensa is a staple and favorite of mine. Thanks for the review. I was just thinking about the black bottle and I think (at least to me) why it is less appealing is that it looks more like a “bath product” than a perfume bottle… I like their other bottles, so it’s not the shape , it’s just the solid black thing. Daisy: hey, weren’t you complaining not so long ago about the CHILLY summer…now the heat is getting to you. Never satisfied! HA! I love COLD, “dirty” lily of the valley, but the type I smell most often is the soapy, powder-puff residue type… I guess I’m the only one who likes the black bottle! oops, got distracted by my own whining and forgot the perfume comment—-I like the damp dirty LotV too…..I was merely wondering if this was a cold LotV or one that turns kind of soapy. For example , Ubar = sharp, bright LotV, Delrae Debut= Cold, VC&A Muguet Blanc = cold & sweet/ slightly soapy. D: I remember everything…just remember that and you’ll be FINE! And this lily of the valley does turn “cold”…then crumbles into dust. A nice thing! Joe: I love Intensa too…the only Acqua di Parma I’ve owned…so far…think I will buy some Essenza. and the only Aqua di Parma I have is Iris Nobile Edp —way far at the other end from manly Colonia …so maybe this one isn’t for me. D: If you think regular Colonia is manly…then this one is not for you…it’s more masculine than Colonia to me…but still very wearable to tough broads and vixens and the type of little girl who puts gum in your hair at recess. hmmm….well…I’m not a “tough broad”….it’s hard to pull off “vixen” in purple sweatpants and a ponytail…..and I was more the peacemaker- smartypants on the playground, and wouldn’t dream of putting gum in anyones hair (since I had VERY long hair and gum-retaliation would have been a nightmare indeed) …..so ummm, you got any other options?? Daisy: wait till next week’s review…I”ll have a scent you can wear in your purple sweatpants on all Peace missions. Sounds intriguing. I like both Assoluta and Intensa from AdP. The original colonia does have, as you say, a soapy/laundry smell. I say fabric softener- that citrus, floral and musk gets loud. Essenza sounds nice so I’m definitely trying it. Tim: I immediately liked Essenza…hope you like it too. Nice review Kevin. This one sounds very appealing, I’ll have to seek it out next time I’m at Nordie’s. Do you think it works best for summer or will it be good for fall? Kevin – I will have to try this. One thing I like about the “other” Acqua di Parma is that they make a nice “travel” version…a little one ounce bottle with a leather case or carrier…very nice for a shaving kit or gym bag. VMFan: those small bottles are GREAT.